Happy New Year! In Japan, we celebrate this new beginning in a very special way. 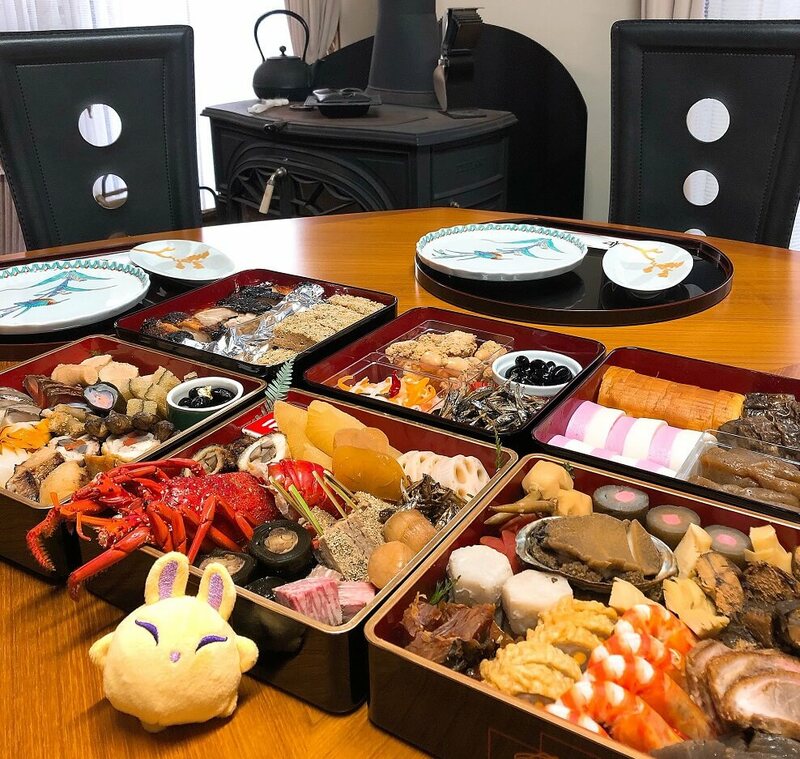 Luna, our adorable mascot, celebrated the New Year at her friend's house where she got to experience the traditional New Year celebration in Japan, called oshogatsu. First of all, kagami-mochi (pictured above in center) is a traditional Japanese New Year decoration, which can be bought from supermarkets and of course, the konbini (convenience store). It varies from region to, but usually, it consists of two round mochi, a sheet of konbu (kelp) and a bitter Japanese orange. 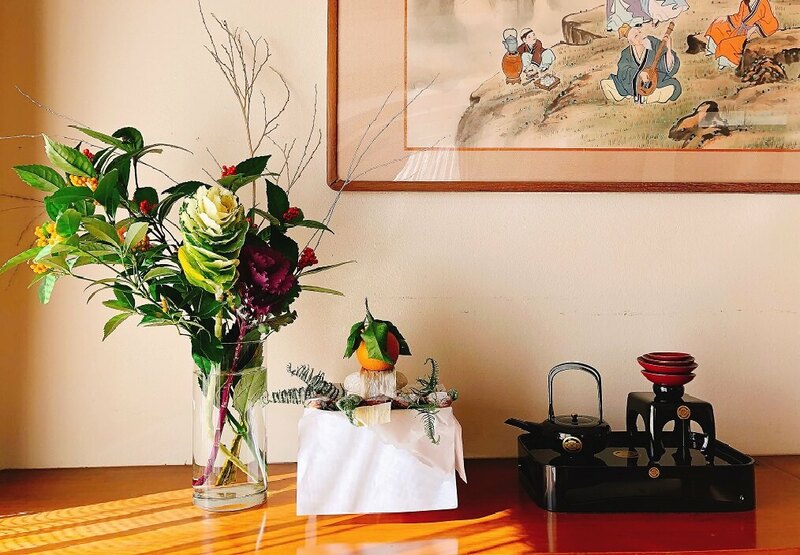 It is placed on a stand (sanpo) over washi paper (shihobeni) in your house, restaurant, business and so on from 28th of December through to 11th January and is said to protect the building from fire. The celebrations begin by drinking a spiced medicinal sake, called otoso, to flush away the previous year's maladies and to aspire to lead a long life. Kanpai! After drinking otoso, the real celebration begins...the eating of osechi ryori, or Japanese New Year Food! Osechi is an assortment of colorful dishes, prepared especially for the New Year in special boxes (jubako). It’s considered the most important meal of the year, as each dish wishes the person well for the coming year. Usually, the jubako are two to three layers, and each layer is packed with different kinds of dishes. A specialty Japanese soup (ozouni), is also served exclusively on the Japanese New Year. There are lots of types of ozouni, Luna had a white (shiro) miso base with baked mochi and vegetables. Luna tried lots of different osechi dishes. Her favorite dish was kouhaku namasu, because it’s sweet and sour. Luna enjoyed celebrating the New Year with her friends, joining in on traditional activities, eating lots and talking about her New Year's resolution. Follow Luna’s adventures in 2019. What kind of celebration did you have?